Do you ever wonder why some New Year's resolutions die a long, slow death while others seem as easy to do as a simple checklist item? It comes down to science. 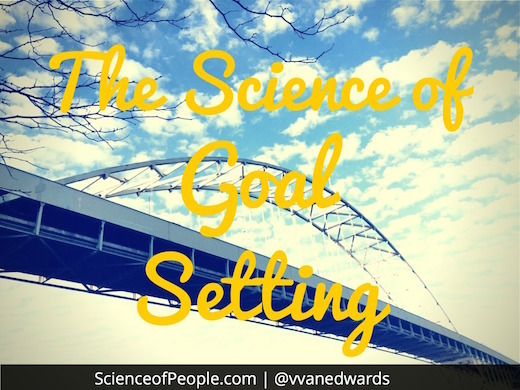 I want to teach you the science of goal-setting. There is a science to setting successful goals and it's not what you would think. In this post I want to talk about how to set your goals effectively and then proactively achieve them. However, not all goals are created equal: Merely fantasizing about your goal is de-motivating-it actually tricks the brain into thinking you have already achieved it. Step #1: What's Your Emotional Temperature? Right now I want you to take your emotional temperature. 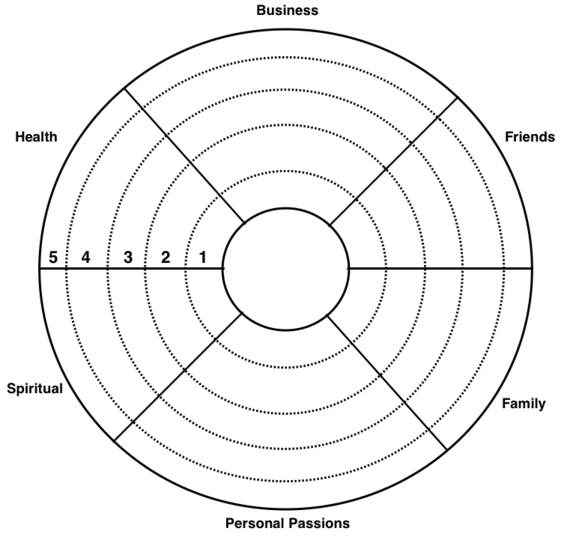 On a piece of paper or on our downloadable goal setting worksheet rate the different areas of your life on a scale from one to five (one being extremely dissatisfied, five being extremely satisfied). *Business: How do you feel about your work, career or business effectiveness and success? *Friends: How is your social life? Your friendships and support system? *Family: How are your personal relationships? Your partner or spouse? *Personal Passions: Do you have personal passion projects, hobbies or fun activities that fulfill you? *Spiritual: You can interpret this one as you like. It could be your faith, mental health, personal journeys or mindset. *Health: Are you happy with your physical health and wellness? 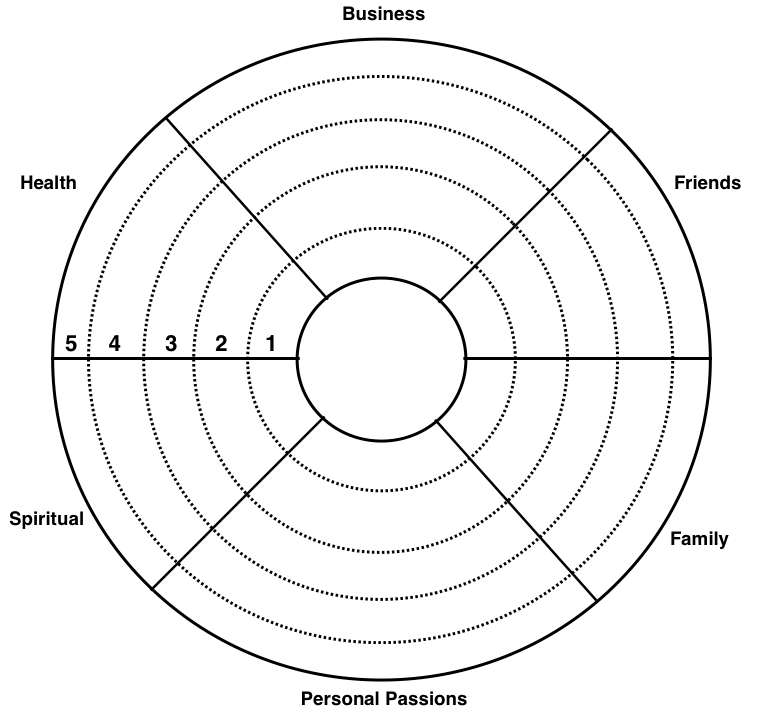 A finished Goal Wheel will have the lines filled in so you can see what your 'emotional temperature' is in each area. Ninja Tip: I save all of my Goal Wheels and then check-in to see if there are any patterns. You can use these worksheets over and over again to see how far you have come from previous months or years depending on how often you do it. In 10 years, what do I want my life to look like? What do I want to be remembered for? What does success mean for me? Take your time and answer these questions well. This sets the stage for successful goal setting. When we take ownership of something-an item, an idea or a goal, we are more committed to it. This is called the "endowment effect" which happens when we take ownership of something and it becomes "ours", thereby integrating into our sense of identity. Cornell University researchers showed the endowment effect with a clever experiment. First, researchers gave participants coffee mugs and offered to trade them chocolate for their mug. Almost none of the participants wanted to trade. Next, researchers reversed the trial. They gave students chocolate and asked them to trade for the coffee mugs. Again, very few wanted to trade. This is the endowment effect in action. It was about what they already had, not about the actual objects. When we take ownership of something we work to keep it. Business: Level up my business efforts so I can reach and help more people. Friends: Set aside time to support and reach out to friends more regularly. Family: See family more often and dedicate real time to connect and catch-up. Personal Passions: Learn how to paint and spend more time reading. Spiritual: Start meditating to create mental space and slow down at the end of a workday. Health: Get more toned and increase my endurance. If I had to pick, I would say this is the most important step: This is why goals fail! Before I give you some examples, let me explain the science behind the Outcome + Process step. Researcher, Barry Zimmerman trained participants to throw darts. They split them up into three groups. Group #1 was told to simply get the highest score possible (outcome trial). Group #2 was told to optimize the process of being a good dart thrower by bringing their arm back, adjusting the angle of the throw and having a firm grip (process trial). Group #3 began with the process of throwing and then once they had mastered the skills were switched to focus on the outcome (process and outcome trial). The participants with the outcome goals performed worst! The process and outcome trial participants got the highest scores by far. Join a class with friends. Plan a weekend getaway. Plan a family reunion that happens on the same holidays each year. Buy a painting book. Get suggestions of 10 books from friends. Get a meditation app to remind me before bed. Buy a weight set and sign-up for a bootcamp. Measurable: Your goals should be quantifiable. There should be a clear ending that can be measured. Actionable: You have to know exactly what you want and the process you need to get there (we did this already in step four). Competent: Your goals have to align with your legacy (step two) and be achievable. If you set yourself up for failure you curse your goal achievement attempts. Business: Hire a marketing agency by March to add 10,000 new subscribers and 5,000 new Twitter followers. Friends: Send five classes to friends to sign up together and get a weekend getaway on the calendar before this summer. Family: Plan a family reunion over Labor Day. Set bi-weekly call dates with sisters. Personal Passions: Buy a painting book. Get suggestions of 10 books from friends. Spiritual: Get a meditation app and set a reminder for 9pm each night. Health: Order a weight set and buy a 12 class bootcamp package. There is a reason we have a free downloadable worksheet and I keep telling you to fill it out. Writing down your goals and steps is an essential part of the achievement process. When you write down your goals it triggers a different part of the brain, helps ownership (Step #3) and keeps you more accountable. I don't care if you use our worksheet, your notebook or a word doc-write them down! What logistical constraints might make it difficult for you achieve your goals? What behaviors might make it difficult for you to achieve your goals? Who might make it difficult for you to achieve your goals? This can be anything from financial constraints to unsupportive family members to procrastination. Get real! When we know what your blockers are we can work to plan around them. For example, one of my goals for next year is to read more. I know that if I don't have accountability to read I just won't get it done. I push it off, go to sleep, turn on Netflix, you know the drill. So, I started a Science of People Book Club to read with my readers. This way I have to post discussion questions and hear what you have to say while I read-this makes me want to read even more! Check out our free and fun to join our Book Club. We just selected our next book! (Thanks for helping keep me accountable). Researchers wanted to see if they could get more students to get their tetanus vaccinations. So they printed up two different leaflets and measured the success of each one. The first had scientific explanations on why students should get vaccinated. The second had gruesome pictures of the effects of tetanus. Neither worked. They made one more trial. They added a map to the leaflet showing the location of the campus' health center and its opening hours. THIS trial worked like magic. Why? The researchers added process and steps on exactly how to get the desired outcome. Now it's time to make your map. In your Goals Worksheet add the steps you need to take to achieve your goal. These can be as small as sending someone an email-in fact the smaller the better. If you can keep your steps to under 10 minutes that's the best! You can always find 10 minutes. Once you have broken your goal up into 10 minute segments for success, I want you to schedule them into your calendar. Set calendar alerts, phone alerts, put post-its up, make a big white board to do list for the month. Schedule your steps into your life. Post on your social networks about your goals to get public accountability. Why wait? Tweet me right now. Get a goal partner and set up times to talk or text every few weeks about your goals. Join Stickk.com and set up financial stakes for your goals. Make an awesome club and use the power of groups to achieve your goals and conquer blockers. Write a response to this post in our Goal Forum and get accountability from other Science of People Tribe members! This is a new way to think about goals-they are always a work in progress until they are achieved. Don't be afraid to revise your goals as you go. Maybe you thought that a family reunion was possible this summer but a cousin just planned her wedding in a far off destination. Revise the goal for a winter getaway! Check in with your goal worksheet every few weeks. Leave it pinned up next to your desk so you can easily access it to revise and update it. As you revise you learn about yourself, you reinvigorate your goal and set yourself up for more MAC Daddy goals next year. One thing I like to do is think about a theme for the year. Last year was the year of learning. My theme for 2015 is all about application-applying all the amazing learning and experimenting from last year to level up my business and relationships. I love thinking about a theme because it centers you in your decisions. Look at your Goal Worksheet and try to find a theme. Fill out your Goal Worksheet. I'm not sure what your goals are, but if we can help: Tell me what your theme for 2014 was and what you are thinking about for 2015!